The only choice for missing teeth used to be removable and fixed dental bridges or removable dentures. Today, the dental implant process and therapy provide a better alternative in nearly all situations. “Our patients who have unfortunately lost teeth regain the ability to eat virtually anything and can smile with confidence, knowing that their teeth appear natural and that their facial contours are preserved,” says Dr. Alexander. A dental implant is typically made of titanium, looks somewhat like a screw, and replaces a tooth’s natural roots. It is surgically placed in the jawbone, and the surrounding bone tissue heals tightly around it over a four to six month period. This bone integration process is known called osseointegration. An abutment goes on top of the dental implant. 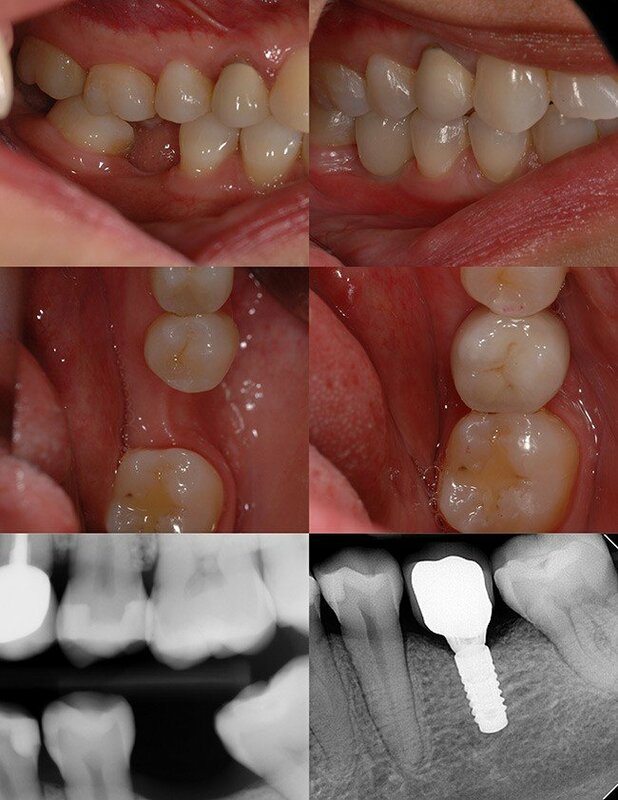 A prosthetic crown or multi-unit bridge can then be attached to the implant abutment. Replacement teeth on dental implants immediately look, feel, and function like natural teeth. They also help maintain bone health and your facial structure. Dental implants are very strong, stable, and durable so they last many years. Occasionally, an attachment or prosthesis may need to be retightened or replaced due to normal wear—but with good home oral hygiene and regular dental visits for teeth cleaning and checkups, your dental implant can last the rest of your life. For individuals who have lost all their teeth or will do so soon, a full overdenture can be fixed on as few as four dental implants in either the upper or lower jaw. The quality of life improves dramatically when this is done. This All-on-4 treatment is highly sought after, and Dr. Alexander will be happy to discuss this option with you. X-rays and impressions (molds) will be taken of your jaw and teeth to determine bone, gum tissue, and spacing available for an implant. Dr. Jamie Alexander will collaborate with an oral surgeon to plan and execute your interdisciplinary treatment. You will receive personalized attention every step of the way. Dental implant surgery is usually carried out under local anesthesia (numbing the area where the implant is to be placed) and is a relatively comfortable procedure. Because Dr. Alexander uses custom implant abutments and prostheses, your gum tissue will be closed over the implant. Since there are no open wounds and the surgery is minimally invasive, there will be little post-operative discomfort. A single implant usually needs to be left for a period of two to four months to fuse to the bone before a prosthetic crown can be attached. The actual healing time depends upon the bone density at the site of the implant. Low bone density requires a longer period of osseointegration. Following successful bone integration, your gum tissue will be opened and the custom abutment placed on the dental implant. 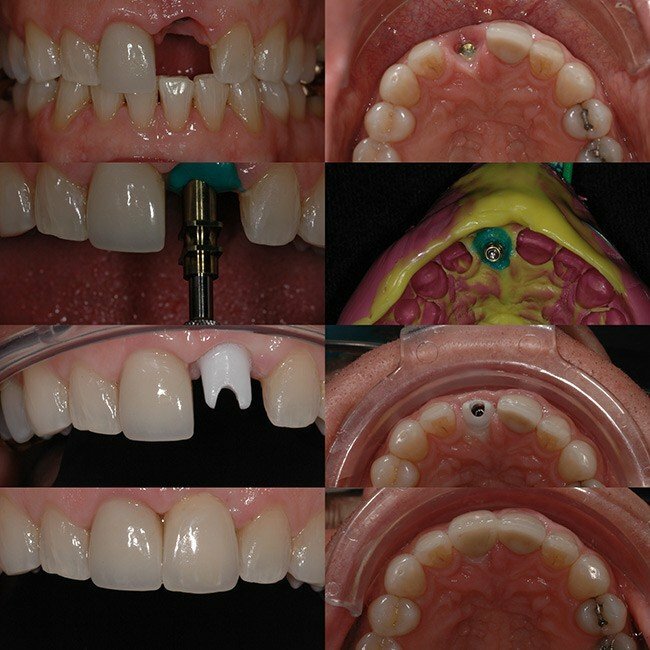 After the gum tissue has healed around the abutment for approximately two months, Dr. Alexander will cement your custom prosthesis in place and make any needed adjustments to make sure your bite and appearance are optimal. At this point, your replacement tooth or teeth should look and function exactly like healthy normal teeth. You will receive detailed care instructions when your treatment is complete. Some patients need to have a bone enhancement procedure performed before they can go through the dental implant process. In this case, the oral surgeon performs a bone graft or sinus lift. Although bone enhancement procedures may sound difficult, they are routine and predictable when you are in the care of an oral surgeon. If you need to have a compromised tooth extracted prior to implant therapy, the oral surgeon can often remove the tooth and perform a bone graft at the same time. Call to Schedule Your Implant Consultation Today! Dr. Jamie Alexander welcomes you to make a consultation appointment. 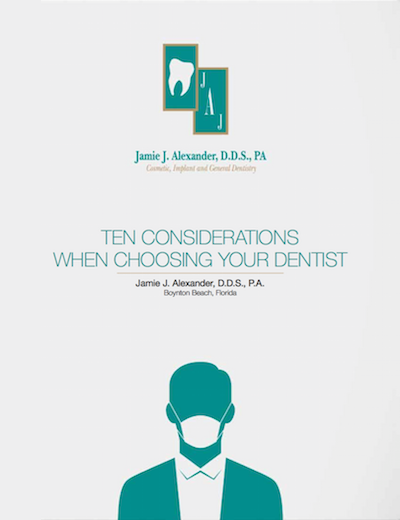 Let Dr. Alexander help you decide if dental implants are a better option for you. Whether you will benefit from a single crown, multi-unit bridge or even a full denture on implants, Dr. Alexander has the expertise to make sure your implant therapy successfully gives you the best comfort, function, health, and appearance you deserve. Contact us today to learn more about our dental implant process! Click on the image to download our free e-book!